. Bonus Episode: Little Einstein's "Christmas Wishes"
When Santa's sleigh breaks down at the top of Mistletoe Mountain, Mickey and Donald race to his rescue. The gang plays a game of hide-and-seek with the world's greatest hider - Donald Duck! And Goofy needs help returning a lost baby bird to its mother in the forest. Be a part of three hilarious stories about helping others and discover that the greatest gift of all is good friends. After so many years, I still staunchly believe that the freaky creatures known as the Teletubbies are evil. You may remember them as the harmless quartet on TV which live in a strange little dome and make strange noises. I remember them as weird oddballs which have wicked intentions of brainwashing viewers. (If you have not heard of these freaks, go check out how popular they were in the late 1990s). In a way, this children’s TV series broadcast on Playhouse Disney Channel is a little like the Teletubbies. Mickey and his friends have this dome-like clubhouse which they summon every episode. Thankfully, Mickey and his pals are so much more wholesome than the outlandish Teletubbies, and the series is so much more educational, creative and imaginative too. There are three episodes featured in this disc. 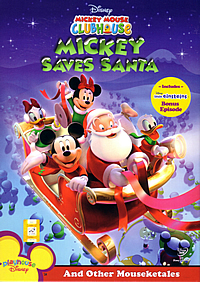 The first, “Mickey Saves Santa”, has Mickey, well, saving Santa on Mistletoe Mountain. The second, “Goofy’s Bird”, sees Goofy having to return a baby bird back to its parents in the forest. The third, “Mickey Go Seek”, is simply about a hide and seek game played by Donald and Mickey. Running at 24 minutes each, the episodes are perfect for pre-schoolers, who can learn while having fun. Don’t be surprised if your little ones actually interact with what’s happening on the screen, shouting “Meeska Mooska Mickey Mouse” to make the clubhouse appear at the beginning of every episode. Also, to help characters solve problems in each episode, Mickey will summon the “Mousekatool”, only if you shout “Oh, Tootles!” with him. Each of the tools on the circular board can help the characters solve a crisis, and kids are encouraged to choose the correct tool together with Mickey. The Disney characters are all in their computer-animated forms, and while it is nothing compared to what Pixar has churned out, the clean and slick look is still attractive enough to capture kids’ attention. Christmas is coming, and instead of cracking your head over what to buy for the really young ones, why not get them this educational disc instead of spending money on yet another cute but pointless soft toy? Just don’t be surprised if you find yourself sitting together with them and chanting “Meeska Mooska Mickey Mouse” and “Oh, Tootles!” in unison. This Code 3 DVD contains a two-minute Music Time “Hot Dog” Dance-Along, which is a dance which Mickey and his pals do at the end of every episode. There is also a Game Time “Mickey’s Picture Puzzle Game” where kids can have fun unscrambling a mixed up picture. A 24-minute Bonus Episode “Little Einsteins Christmas Wishes” is also included on the disc. The animated series broadcast on Playhouse Disney Channel teaches kids art and music appreciation, and is an ultimate joy to watch. In this particular episode, learn about Van Gogh’s art piece and Ludwig van Beethoven’s music. The disc’s visual transfer is pristine and crisp, and there are 2.0 Stereo English, Thai, Mandarin, Korean, Spanish and Portuguese audio tracks to choose from.